This year, we are starting our formal piano lessons. We were blessed with a great piano that fits just perfectly in our lounge/media room. The girls have been so excited to start lessons and already they have learned a lot. I don't have a formal book that I am teaching them from. I just started with scales and moved to them learning how to play Jesus Loves Me. I am so excited that the girls are dedicated to practicing and learning even the scales and finger exercises. I hope their enthusiasm doesn't fizzle out when the novelty wears off. I searched around online and found these great resources for teaching piano that I thought I would share. Making Music Fun has online games, printable lessons, songs, composer biographies and worksheets and so much more. Susan Paradis has several great resources on her site. 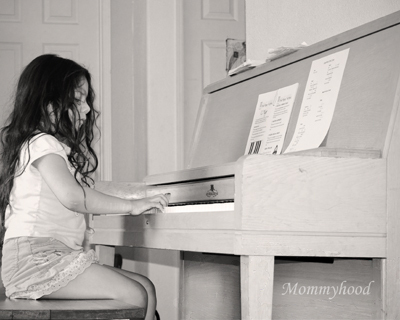 I love that she offers pre-reading music printables as well as composing worksheets, games and other resources, perfect for little ones and not so little ones. Piano Discoveries has teaching aids and activities along with ipad goodies. There are some great little videos on this site also. Music Fun has several different worksheet sets to print out. A great site for music theory. Color In My Piano has so many resources for young and old, beginning and advanced. Little G practicing after her first lesson. Thanks, I'll look into those, I do want to use a book at some point for sure.